It might be pretty easy to list all the things in your life that are a pain in your neck: your neighbors, your boss, your daily commute, and even occasionally your mother-in-law. But none of these are worse than having a literal pain in your neck. Neck pain can really limit your quality of life. Doing anything more than siting around immobile can seem like a serious chore, and if you experience neck pain regularly, you’ve likely come to accept that that’s all you’re really capable of when the pain hits. It can keep you on the sofa or bed for days at a time, making every simple chore a painful and demanding experience. But it doesn’t have to be that way. If you suffer from occasional neck pain or even experience it more regularly, you can control it and limit its impact on your day-to-day routine and overall quality of life. There are a number of things you can try at home to prevent this common nuisance, so you can get up, get out, feel good, and live your life. Although it’s not supported by scientific evidence, real-life experience shows that heat and ice can help. It might not make a difference for everybody, but it’s always worth a try. Take a heating pad or ice pack and apply it to your neck for about 15–20 minutes every two to three hours. I prefer using an electric heating pad because I find it loosens up the muscles, draws in blood, and just provides feel-good pain relief. It’s far more relaxing than a cold pack, that’s for sure! (Though on hot summer days, ice may be the better choice.) Just make sure the heating pad isn’t too hot because you don’t want to burn yourself. Start at a low or medium setting and adjust to feel. Sometimes I like to replace a heating pad session with a nice warm shower. I’ll stay in the shower a little longer and make sure the water is hitting my neck. It provides the warmth, while offering a massaging sensation to help relieve the pain. I also recommend that you slowly roll your neck and stretch it out during your shower. Movement is also a great way to prevent and treat a sore neck. Sitting around immobile might feel like the best thing to do, but slightly pushing yourself to get out and be active can be helpful. Now I’m not talking about going for a run, playing some high-intensity sport, or lifting weights; I’m talking about going for a walk around the block or attempting to stretch your body out, maybe with a bit of yoga. Activity is good for your body, because it gets the blood flowing and can remove pains no matter where they are. Stretching and exercising your neck specifically is also something that can get the blood in there, increasing mobility and potentially soothing pain. Try putting your hands on your forehead and slightly, slowly push your head forward and downward, providing resistance with your hands. This should stretch and work the muscles in your neck. Once you’ve done this, work your way around the head to cover each side and the back, too. Another good move is to look in one direction and tilt your head down so the chin is as close as possible—or even touching—the shoulder. Then slowly roll your head to the other shoulder and back. 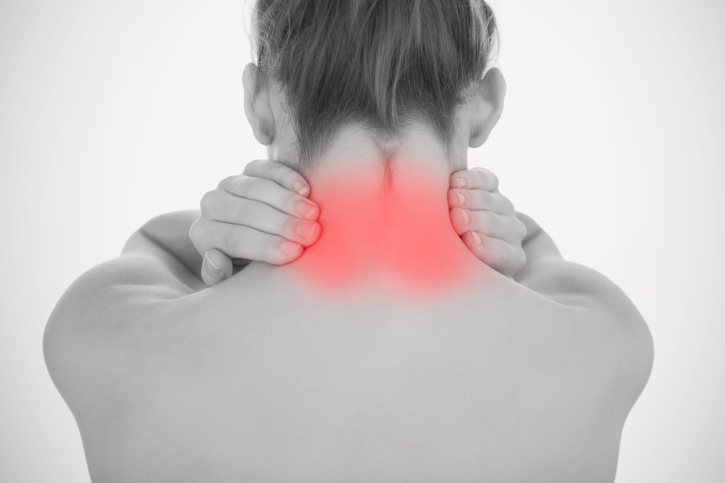 Try these tactics for short-term pain relief and as a preventative treatment for neck pain. You may find yourself using less aspirin and spending fewer hours on the couch!